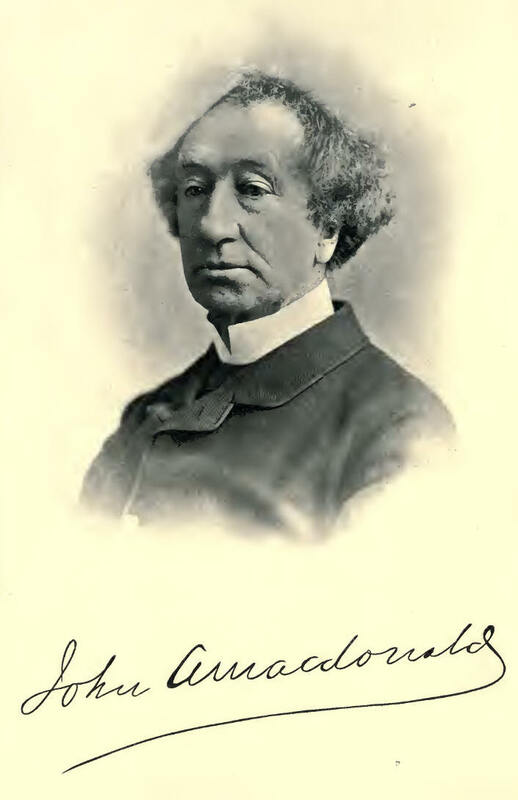 BY common consent Sir John Alexander Macdonald has been assigned the foremost place among the statesmen whom the public life of Canada has hitherto produced. Popular opinion on this point has been ratified by the stricter and measured judgment of the ablest men among his Canadian contemporaries with whom he was brought into close personal and official contact. It was equally ratified, even during his lifetime, by opinion in Britain, where those who best knew his work recognized in him one of the foremost statesmen of the empire. At his death the creation of a peerage for his widow put a special stamp of national recognition upon the singular services which he had rendered to Canada and the nation. A memorial tablet in the crypt of St. Paul's Cathedral—his statue adorning the squares of most of the larger Canadian cities—indicate the general desire to perpetuate his memory. If special honour is due to those who by wise constructive statesmanship lay broad and deep the foundations of a great state, then to such honour Sir John Macdonald is fairly entitled. No public man has ever in Canada won in an equal degree the sustained admiration of his fellow-citizens, and at the same time their affection, as had Macdonald at the time of his death. That he should have done this in spite of grave political errors and acknowledged personal defects, and as the general outcome of a life spent in the very furnace of party conflict, makes the achievement all the more striking. For many years before Confederation his history is an essential part of the political history of the province of Canada as then constituted; for nearly twenty-five years afterwards it is practically that of the whole Dominion. While many men and many forces contributed to that great end, it is scarcely an exaggeration to say that it was his personality which in 1867 made the confederation of British North America possible. Rightly understood this period was as critical for the empire as it was for the colony itself. No one can doubt that the whole future development of the imperial system is destined to be profoundly affected by the course of action then taken. It was fortunate that at such a time Canada possessed a public man who was versed in all the intricacies of local politics, and endowed with the peculiar skill which creates and holds together parliamentary majorities, and who at the same time had a mind capable of grasping the problems of a broad national statesmanship. The colonial politician, guided by a few dominant principles, gradually developed, under the pressure of circumstances and the needs of a great occasion, into an imperial statesman who has left a lasting stamp upon the policy of the nation. The confederation of Canada under the Crown inaugurated the new idea and the new organization of the empire. That organization is still far from complete. Other great groups of colonies are feeling their way towards a consolidation similar to that which has conferred such immense advantage on the Dominion. The empire as a whole begins to realize that it has not yet reached its final goal in the process of political evolution. The period in which we live is, therefore, one of national transition where every lesson of experience has extreme value. The work of the men who laid well and truly the constitutional foundations of the Dominion has now stood the test of nearly forty years of stress and strain. A political system which commands public confidence, a healthy national spirit, great material prosperity, and well grounded hope for an ever-widening and successful future are results apparent to the ordinary observer. The labours of Macdonald and his fellow-workers in adapting British constitutional principles to a federal system have become a part, and no unimportant part, of our national heritage. A recognition of the value of the work they accomplished will facilitate further national development. The historical facts of a period tend to group themselves around its strongest and most representative personality. The man's history becomes the history of his time. Thus Canadians will always associate with the figure of their great leader the group of events which transformed their country from a number of isolated colonies, provincial in thought and policy, into a consolidated and self-reliant Dominion, filled with those hopes of a vast future which are naturally inspired by the possession of one-half. of a great continent. Even before the end of his life Macdonald had come to be looked upon as embodying, more than any one else, the spirit and purpose of the Canadian people. The tradition is one which seems likely to grow with the growth of the Dominion and with the fuller and more general recognition of the significance of the work he did and of the critical character of the period in which that work was accomplished. My aim in this volume will be to bring this tradition within the limits of true historical perspective, so far as this is possible in a limited space and in dealing with events still close at hand. I wish to outline concisely, but at the same time clearly, the career of the man who guided the destinies of my country through the anxious years which preceded Confederation and the difficult and not untroubled ones which followed the union of the provinces. For such a condensed biography there seems a distinct need. Sketches of Macdonald's career were written during his life, but mainly for party purposes and with a strong party bias. The two large volumes in which, since his death, Mr. Pope has ably redeemed the trust committed to him of being the literary executor of his old chief, and those in which Colonel Macpherson has embodied many of his uncle's most important speeches, may be recommended to all who have the wish and the opportunity to study the details of Canadian politics. To both I have been constantly indebted. But either of these works is too voluminous, in these days of many books, for readers who can only spare the time to master essential facts. It is for such readers that this short biography is intended. I hope that in trying to condense I have not become obscure; that in the effort to be brief, no fact of major significance has been omitted. It is not an easy task to separate in all cases the false from the true, or to form an impartial judgment in writing of a man whose every public word and deed was regarded from a party point of view at a period when party passion was extreme; whose actions and purposes are perhaps as unfairly judged by the adulation of supporters as by the hostile interpretation of opponents. It may be a century before the final biography of Macdonald can be written, and his true place among contemporary statesmen assigned to him on clear historical grounds. Meanwhile, an attempt to separate the kernel of his achievement as a statesman from the husk of political controversy, in which the work of public men is so often hidden, may serve a patriotic purpose. It is in this belief that the present volume has been prepared. I have to acknowledge valuable assistance given to me in the preparation of Chapters V, VI and VII, by Mr. W. L. Grant, Beit Lecturer in Colonial History in the University of Oxford; assistance which he was specially qualified to give through his own studies of contemporaneous Canadian history made in connection with the biography of his distinguished father, the late Principal Grant. I must also gratefully acknowledge my indebtedness to Dr. W. D. Le Sueur, whose sound judgment and full knowledge have been of inestimable advantage in the revision of the MS. and proof.